Have you tried "rockstar" Biore cleansing oil makeup remover? Yeah I called it rockstar because it totally rock me! And I absolutely love this Biore! Hhmmm I know some of you are little skeptical about this genius but let me share you my hands-on experience and enjoyable moment with this cleanser. So what is this Biore Cleansing Oil Makeup Remover? Biore Cleansing Oil Makeup Remover is an oil-based make-up remover from Japan and has an excellent cleansing ability that makes makeup removal so quick and easy! Suitable for medium to heavy makeup users, it effectively dissolves and removes stubborn make-up, and even waterproof mascara, while lifting away dirt and impurities. Unlike typical oil makeup removers, it does not emulsify upon contact with water, thus maintaining its optimal cleansing performance at all times. So here’s me before I tried Biore, and yes still my makeup on because I just got home from meeting with an agency and friends. Notice that I have my eyebrows penciled, full face powder with lipstick on.. muahh! You may watch my video clip here how Biore and me did this in ACTION! See how CLEAN my face after?! Biore Cleansing oil is totally a Rockstar! It gently cleanses my face plus moisturized it. No harsh after-effect or irritation. Plus I love its grapey-scent! Smells yummy! 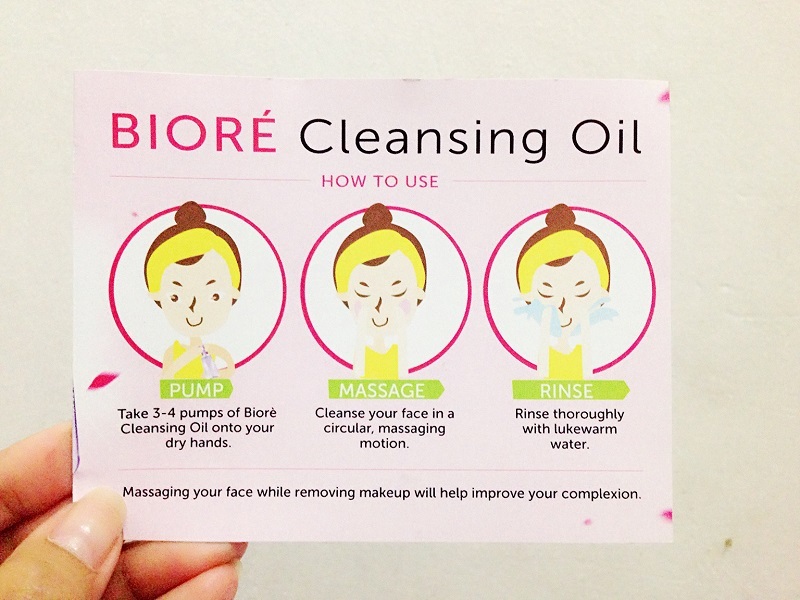 So, how to use this Biore Cleansing Oil Make Up Remover? Do I need to use cotton balls or wipes??? NO need for those, just follow these simple steps! Okay, Okay I am almost convinced but, how much is this? Is this too expensive? NO Lah! Your stilettos are more expensive than this cleansing oil! 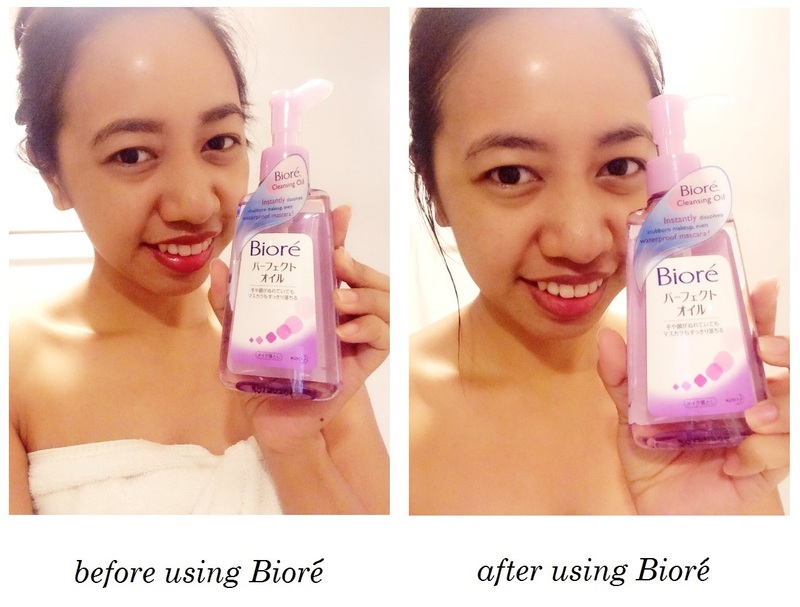 Biore Cleansing Oil Make up Remover is only Php299.00 ($6.50) for 150ml bottle Another reason what I like about Biore? Notice that cap? This helps to secure the pump-head for spilling or possible leak when it turns upside down. So cool, right? But before I ended by chica, I'd like to say THANK YOU BDJBox Team and Biore Philippines for sending me these product samples. These are included to September 2015 BDJBox beauty box I've got from these ladies, and I felt so happy when I've got it. I've been itching to try these Biore 3 months ago, but then I always ended up postponing buying for a try-and-test sample. 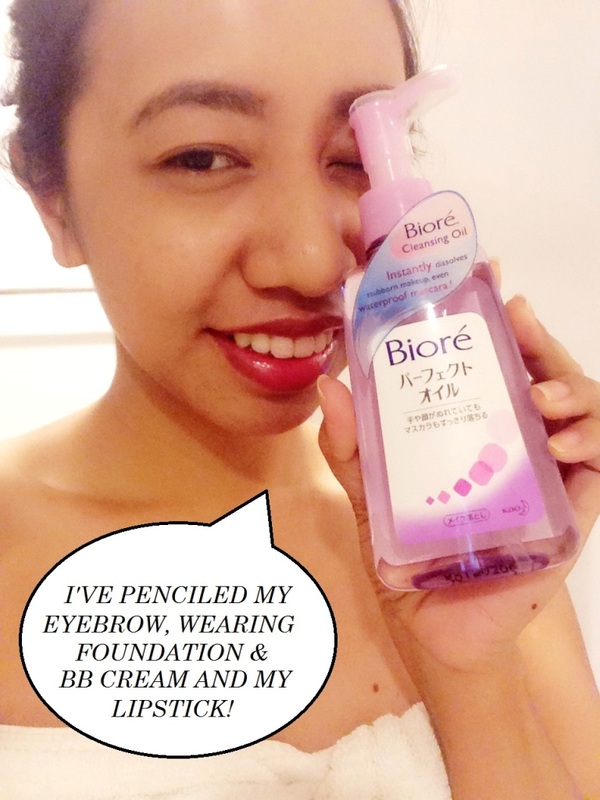 I ended up liking this Biore Cleansing Oil Make up Remover (and wipes too!) so I didn't hesitate to share my reviews with you my girlfriends! Biore is a trademark of Kao Corporation, Japan Imported by: Kao Singapore Pte Ltd. The product sounds perfect for me -- I know my skin gets easily irritated so I'm glad this one doesn't do that.